The U.S. solar industry has logged one of the strongest quarters ever and it has already eclipsed last year’s record breaking growth. The U.S. is riding the crest of a solar tsunami that is sweeping around the planet. 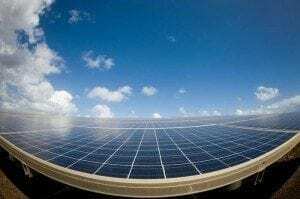 Declining photovoltaic (PV) prices along with attractive incentives in Asia (Japan and China) are helping to power solar’s global growth in 2013. Around the world solar PV added 30.5 Gigawatts (GW) of new capacity in 2012 and Bloomberg New Energy Finance predicts that we will see 36.7 GW of additional PV capacity worldwide in 2013. The growth of solar power is so strong that it is outpacing wind energy for the first time this year. In 2012, the U.S. brought more new solar capacity online than in the combined totals of the three previous years. In the first quarter (Q1) of 2013, solar power production was 537 megawatts (MW) of the 1,880 MW of utility power brought online. This represents about 30 percent of the new generation capacity. In Q2 Solar Energy Industries Association (SEIA) reports that the U.S. installed 832 MW of photovoltaic (PV) solar power which represents a 15 percent increase over Q1. This is the second largest quarter in the history of U.S. Solar. It is worth noting that these numbers reflect only the larger generating facilities and not systems on homes or small businesses. As of the end of Q2 2013, the cumulative commercial solar deployment totaled 3,380 MW and was located at more than 32,800 facilities across the country representing an increase of more than 40 percent over 2012. According to data from the Federal Energy Regulatory Commission, as of August 2013, the U.S. had already surpassed the year end totals for utility-scale solar installations in 2012 (1,774 MW compared to 1,476 MW). The solar electric market will have another record year in 2013, with a projected year end total of 4,400 MW of PV (which represents 30 percent growth over 2012 installation totals) and over 900 MW of concentrating solar power (CSP). Together PV and CSP total energy output is equivalent to the energy required to power 860,000 American homes. Cumulative PV capacity is projected to surpass 10 GW by years end. The most powerful driver of solar growth is declining prices. We have seen an 11 percent decrease in PV over the past year. Over the past two years PV prices have fallen by nearly 40 percent, and over the last three years the average price of solar panels has declined by 60 percent. Other factors are also at play and they include renewable portfolio standards and renewable energy credits that have forced utilities to add in more solar. Businesses are looking to reduce their environmental impacts and cut energy costs. Across the board solar is being accepted as an increasingly mainstream and less esoteric form of energy. Solar is an abundant source of energy, if only 1 percent of global landmass were covered in solar panels we could power all of the world’s energy needs. Solar is also a very popular energy source in the U.S. As revealed in a 2012 poll, 92 percent of American voters support developing more solar energy. Solar is not just good for the environment it is also a powerful economic driver. According to the Solar Foundation, as of 2012, 119,000 Americans were already employed in the solar industry, this represents a 13.2 percent increase over the preceding year. There are a total of 6,100 businesses operating across the U.S. In 2012 the total value of solar electric installations was $11.5 billion, compared to $8.6 billion in 2011 and $6 billion in 2010. SEIA and the Vote Solar Initiative (Vote Solar) released their annual Solar Means Business report on October 15, they found that some of the biggest corporate entities in the U.S. Are helping to drive the growth of solar energy power production. The top 25 U.S. companies have deployed 445 megawatts of solar capacity, a 48 percent increase from one year ago. Solar proves a competitive business advantage for some of America’s largest corporations. However, it is not just well known corporate behemoths like Walmart that are getting in on the action. A restaurant called Pizza Port in California has also installed solar panels into its operation, and the chain of five restaurants and breweries, expects to reduce energy costs by as much as $30,000 annually. “For years, the promise of solar was always ‘just around the corner.’ Well, solar has turned the corner, and found itself on Main Street, USA. These companies – titans of American business – may have vastly different products, business models, and geographic locations, but they all have something in common: they know a good deal when they see one, and they are going solar in a big way,” said Adam Browning, Executive Director of Vote Solar. There are several states that are well known solar players, they include California, Hawaii, Arizona, New Jersey, and North Carolina. However, as pointed out by GTM Research, there is a surprising amount of solar power anticipated from unlikely places with “hidden growth opportunities.” They include Minnesota, Virginia, Washington D.C., Louisiana and Georgia. GTM Research projects a total of over 1 GW of solar PV demand in these markets between the second half of 2013 and 2016. Solar is providing an ever growing amount of energy to utilities, businesses and homes. Despite retrenchments due to oversupply and resultant low prices, U.S. solar will continue to shine well into the future.